Dedication: The Archbishop of Sydney, assisted by the Rector, Reverend E. S. Wilkinson, dedicated the instrument on Sunday, March 11, 1900, there being 340 in the morning service congregation, the same number at the afternoon confirmation service, and 288 in the evening. Text of the Archbishop's Sermon was from Psalm 17: "Sing praises to God . . ."
The collections totalled £33 - sufficient to pay off the remaining debt on the organ, total cost of which was some £380. The same month, Ben Osborne gave £20 for a new 2ft. stop (the piccolo harmonic), and, by the end of March, installation work had been finished. The First Recital: The first recital was given by Arthur Massey, assisted by his wife as soloist, and also by Cecil Compton (who had been appointed organist and choir- master in October, 1899, from many applicants, after eight years in a similar capacity at Moss Vale Church of England), and the choir. Later history: Other important steps were, the installation of a gas engine to power the blower in 1901 (apparently nine pennyworth of gas then gave 10 hours' service); and some years later the organist, G. E. Vincent, advised doing away with the gas engine and substituting some better method of supplying air to the organ, as the engine and bellows were noisy. Finally, electricity was used for the first time in the church, both for lighting and to power an electric motor, replacing the gas engine, on December 21, 1924. So far as is known, the organ is the largest church instrument of its kind between Sydney and Goulburn, and is certainly the largest in the Berrima District. It has Great, Swell and Pedal organ components, and 16 stops as well as couplers, including the Clarabella and Principal stops added in 1935 in memory of the late G. E. Vincent, organist and choirmaster at St Jude's from 1908 until his death on March 6, 1932. Despite Richardson's skill, the organ chamber proved too small, and it was found that, although the walls had been covered with a solution reputedly impervious to damp, the organ was being affected by damp air, and steps were taken to enlarge the chamber at a cost of £40, a contractor named Potter doing the work. The chamber was thus doubled in size and permitted the pipes to be set parallel to a new wall. 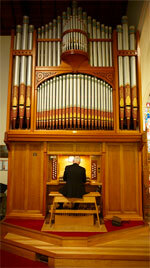 During the history of the organ, numbers of repairs have, of course, been necessary. The major undertaking having been the expenditure of some £365 in 1955 restoring the instrument to its original quality. The Richardson Organ was originally built in the English Romantic tradition, but in 1981 it was completely rebuilt and extensively modified by the Melbourne firm of Finchams. This rebuild converted the Organ into the neo-classical style in vogue at the time and changed radically its tonal qualities and its action. At this time, the organ was moved slightly so that it protruded further into the Church and the console was moved from the north wall of the Chancel to the eastern wall of the Transept. In the late 1990s it was decided that the Organ was again in need of a major overhaul and Peter D G Jewkes Organ Builders was employed to restore the Organ's action and make some tonal modifications to make the instrument more eclectic. The first stage of this work was completed in 2003 when much of the Organ's action and wind system was replaced and a stop combination piston system was installed. The second stage was completed in 2005 when a Trumpet Stop was added and further work was done on the action. The third stage was completed in 2008. This stage significantly upgraded the Swell Organ by adding a Violin Diapason 8; replacing the Gemshorn 4 with a Principal 4; re-footing the Oboe 8 and extending the rank to enable it to double as a Contra Oboe 16; and adding a Cornopean 8. The next stage of the project involved the cleaning of the Great Organ pipe work; the replacement of the Pedal board and the addition of the Contra Oboe 16 to speak as an independent Pedal Organ stop. To cope with the additional stops the piston system was upgraded. This stage is being completed with the addition of two digital stops to the Pedal Organ: a Open Wood 16 and a Double Open Wood 32. To finance this work, members of the Church and local community have been invited to sponsor pipes. To date, pipes have been sponsored by individuals, families and organizations. The St Jude's Organ is significant to the Southern Highlands in that it is the largest and most complete instrument of its kind in the area capable of handling most of the standard organ repertoire. It is used regularly for services as well as for recitals at the Mid-week Lunchtime Series, Music in Autumn, Music in Spring, an annual Sponsors' Recital and in other Community Concerts in the Church. If you would like to Sponsor a pipe or pipes in the St Jude’s Organ by making a tax-deductible donations to the St Jude's Music Association Public Fun, please email organist@bowralanglican.org.au. The Charles Richardson Pipe Organ. Early history: In November, 1898, the Sydney organ specialist Charles Richardson conferred, in Bowral, with the Rector and churchwardens, advised a pipe organ costing £350 as most suitable for the church's requirements and offered to build a section for £250, and finish the work when the other £100 was forthcoming. Mrs. H. M. (Emily) Oxley was able to guarantee that the £250 would be in hand by the following Easter, and, after discussion of technical details, Richardson was asked to submit plans and specifications for a £250 organ, which, with the consent of the parishioners, could be proceeded with without delay. A meeting in February, 1899, authorised the Rector and wardens to obtain the instrument from Richardson, nearly £300 then being in hand, and a motion was carried acclaiming Mrs. Emily Oxley for initiating collection of funds, the service of ladies and friends who had assisted, and the generosity of a Mrs. Gadsden for her contributions. Arthur Massey, organist at St Barnabas', Sydney, authorised progress payments, and the work, under the contract, was to be finished by the following December, although, in fact, delays occurred, and the organ did not arrive in Bowral until February 5, 1900 - whereupon Richardson and two assistants set about its installation. Eight channel capture system for pistons.